The Wakefield Fire Department responded to 220 emergency incidents during the month of December 2006 including 41 Box Alarms and 179 Still Alarms. 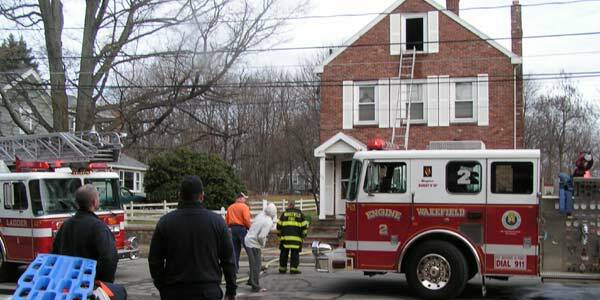 The Wakefield Fire Department responded to a serious house fire at 22 Traverse Street mid-day on Friday, December 22, 2006. The fire, started by a carelessly discarded cigarette, heavily damaged the third floor of this single family home. An excellent “textbook” firefighting attack led by Acting Captain Joseph Riley prevented a more serious fire situation and more extensive damage to the home. On December 1, 2006, Wakefield Engine 2 staffed by Lieutenant Randy Hudson and Firefighters Chris Smith and Rob Ford responded to and assisted at a very serious 4-alarm house fire at 52 Bancroft Avenue in the Town of Reading. The fire department responded to 8 mutual aid requests during December, including Melrose (1), Lynnfield (3), Saugus (1), Stoneham (2) and Reading (1). The department received mutual aid once in December, that being from the Town of Stoneham. On December 8, 2006, all of the department’s self-contained breathing apparatus were inspected, tested, and repaired as necessary. Firefighter Richard B. Cardavelli graduated from the Massachusetts Firefighting Academy – Recruit Training Program on December 22, 2006. The Wakefield Fire Department responded to 207 emergency incidents during the month of November 2006 including 35 Box Alarms and 172 Still Alarms. The Wakefield Fire Department sent aid to the Town of Danvers during the early morning hours of Wednesday, November 22nd, when a tremendous and violent explosion felt here in Wakefield destroyed a chemical plant and ravaged the adjoining neighborhoods. Wakefield Engine 2 was dispatched and assigned to the staging area at the Riverside School in Danvers, but fortunately was not needed at the scene and returned to Wakefield. The Wakefield Auxiliary Fire Department responded to the blast scene in Danvers with their Squad – Lighting Unit during the late afternoon – evening of November 22nd to provide lighting for the firefighting / haz-mat / investigation operations. The fire department responded to 6 mutual aid requests during November, including Melrose (2), Lynnfield (2), Saugus (1) and Danvers (1). The department received mutual aid on 1 occasion in November, that being from the Town of Stoneham. We would also like to acknowledge a very generous gift to the fire department from our friends at the Smurfit-Stone Container Corporation on Audubon Road. It is our hope to use these funds to help equip our new pumper engine due for delivery in early 2007. Finally, L. Murray Young, a lifelong Wakefield resident and ardent supporter of the Wakefield Fire Department, passed away suddenly on November 30th. Murray served as an Auxiliary Firefighter, served on the Montrose Fire Station Study Committee, the Public Safety Building Committee, and was the Wakefield Fire Department Historian. Murray was always there to support and assist the fire department and his hometown of Wakefield. He will be sorely missed. The Wakefield Fire Department responded to 248 emergency incidents during the month of October 2006 including 46 Box Alarms and 202 Still Alarms. Fatal Fourth Alarm Fire at 29 Yale Ave.The most serious incident during October was a 4-alarm house fire at 29 Yale Avenue (Box 342) on the evening of October 27th. This fire had a tremendous head start as our only 9-1-1 calls were received from neighbors at 8:59 PM. First arriving firefighters under the direction of Captain David Myette found heavy fire on the first floor that had already extended to the second and third floors of the 3-story home built in 1860. Firefighters had to work fast to prevent this fire from spreading to the surrounding homes on Yale Avenue. Firefighters Brian Purcell and Joseph Nee, while conducting a primary search under heavy smoke and fire conditions, found the lone occupant of the home, Mr. Phillip Freethy, age 88, in a first floor hallway. Mr. Freethy was immediately rescued from the home and turned over to Paramedics who worked feverishly to resuscitate him. Tragically, Mr. Freethy was pronounced dead at Melrose-Wakefield Hospital. The cause of this fire was determined to be accidental / electrical. The fire department responded to 6 mutual aid requests during July, including Melrose (5) and Lynnfield (1). The department received mutual aid on 11 occasions in October, mainly to assist at the 4-alarm fire on Yale Avenue on October 27th from Stoneham (2) and Reading (1), Melrose (1), Lynnfield (1), North Reading (1), Saugus (1), Malden (1), Middleton (1), Woburn (1), and Revere (1). October is traditionally Fire Prevention Month, and firefighters coordinated by Fire Prevention Officer Captain Paul J. Pronco and utilizing a gift from Alcoa-Reynolds Food Packaging Co., once again visited all of the public and private elementary schools with the Fire Safety House, an excellent hands-on fire safety education tool that has been very popular and effective. In addition, school fire drills were conducted in all school buildings and the fire department assisted with several school evacuation drills. Firefighters Richard Cardavelli and Marnie Sheeran began 12-weeks of training at the Recruit Firefighter Training Program at the Massachusetts Firefighting Academy on Monday, October 2nd with their graduation set for Friday, December 22nd. We would also like to acknowledge two gifts to the fire department from Couto Management, the local Dunkin Donuts franchisee ($ 2,000), and from Irving Oil Company ($ 2,500). We are also very pleased with an anonymous donation that has provided the lettering “WAKEFIELD FIRE DEPARTMENT” over our overhead garage bay doors on the Crescent Street side of the Public Safety Building. We very much appreciate the support from the community. In the area of Emergency Management, Wakefield was a significant player in a 15-community tabletop disaster exercise conducted on October 25th by the Mystic Regional Emergency Planning Committee. In addition, we have recently re-surveyed our designated shelter facilities with representatives of the Red Cross, and have been working with officials from Hallmark Health on a plan for a potential pandemic flu outbreak. The Wakefield Fire Department responded to 236 emergency incidents during the month of September 2006 including 42 Box Alarms and 194 Still Alarms. There were several serious fires during September including an attic fire at a Main Street home on September, 7th, an electrical fire at a home on Summer Street on September 15th, a kitchen fire at a Water Street home on September 26th, and a suspicious package that required the response of the State Police Bomb Squad at Shaw’s Supermarket on September 11th. The fire department responded to only 1 mutual aid request during September, that being to Saugus on September 28th. The department received mutual aid on 3 occasions in September, from Stoneham (2) and Reading (1). Firefighters John Hurley and Robert Brown, Jr. graduated from the Massachusetts Firefighting Academy 12-week Recruit Firefighter Training Program on September 29th. During September the 3 pumper engines were tested and certified; all department ladders including the 100’ aerial ladder were tested and certified; and all department vehicles received their annual Registry of Motor Vehicles inspection. The Wakefield Fire Department responded to 249 emergency incidents during the month of August 2006 including 32 Box Alarms and 217 Still Alarms. The most serious incident during August was the 4-alarm fire that heavily damaged a home at 7 Shumway Circle at 5:26 AM on the morning of August 24th. Mutual aid from 11 communities was needed to assist the Wakefield Fire Department in a very difficult and stubborn fire that started accidentally on the kitchen stove and spread rapidly inside the walls and ceilings of the 100+ year old home. A smoke detector is credited with saving the family of 4 at home at the time of the fire. Fortunately there were no injuries reported to the family or the some 50 firefighters who fought this dangerous fire. The fire department responded to 4 mutual aid requests during August, including Melrose (1), Reading (1), Lynnfield (1), and Saugus (1). The department received mutual aid from 11 communities in August, all to assist in battling the 4-alarm fire on Shumway Circle and including Stoneham, Reading, Lynnfield, Melrose, North Reading, Woburn, Winchester, Middleton, Malden, Wilmington and Burlington. During August the department conducted quarterly inspections of lodging houses, hotels and nursing homes, conducted pre-opening inspections of all school facilities, and participated in another very successful “Common Ground” public safety day on the Common on August 19th. This was the 10th annual Common Ground event that is sponsored by the Wakefield-Lynnfield Lodge of Elks and we thank the Elks for their support of this very popular and successful event. Retired Captain Charles CurranOn August 25th the department participated in the funeral of retired Fire Captain Charles C. Curran, who passed away on August 22, 2006 at the age of 80. 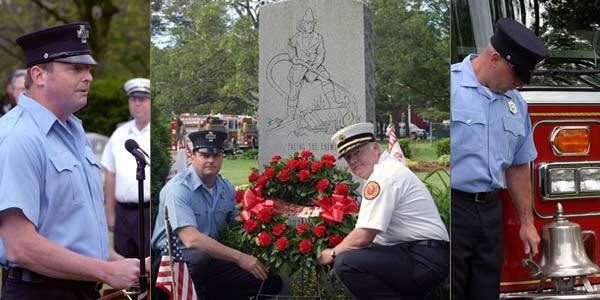 Captain Curran, a decorated WW II veteran, served the Town of Wakefield and the fire department for 45 years. Training using a vacant or soon to be demolished house on Wiley St. The Wakefield Fire Department responded to 233 emergency incidents during the month of July 2006 including 60 Box Alarms and 173 Still Alarms. 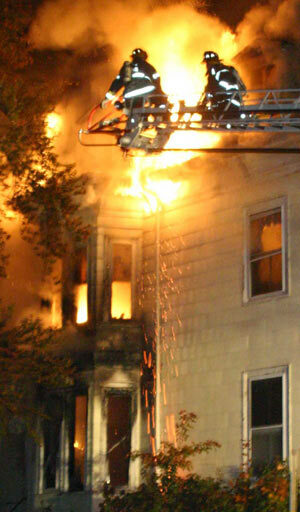 The most serious incident during July was a raging fire at 16 Mansion Road on the evening of July 9th. This fire involved 2 motor vehicles parked in a two-car garage under a split-level style home. Fortunately, due to an early 9-1-1 call reporting the fire coupled with a fast attack by firefighters, there were no injuries and further damage to the attached home was prevented. Ironically, firefighters fought this fire using the same fire hydrant used to combat the four-alarm fire at the nearby Winship Mansion in March of 2005. The fire department responded to 11 mutual aid requests during July, including Melrose (1), Reading (1), Lynnfield (1), Lynn (1), and Saugus (3), Malden (1), Stoneham (2) and Chelsea (1). The department received mutual aid on 3 occasions in July, from Stoneham (1) and Reading (2). Firefighter Robert W. Jordan retired from the department on July 6, 2006. 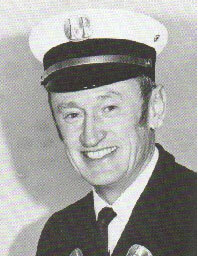 Firefighter Jordan was appointed a Permanent Firefighter on October 21, 1974. We thank him for his nearly 32 years of service to the Wakefield Fire Department and wish him and his wife Marilyn a happy and healthy retirement. The department was also busy dealing with the traditional issues relating to our annual Fourth of July parade and fireworks celebrations. We are pleased to report that this years events went off without incident. The Wakefield Fire Department responded to 249 emergency incidents during the month of June 2006 including 32 Box Alarms and 217 Still Alarms. The fire department responded to 1 mutual aid request, a response to Stoneham, and did not receive mutual aid during June. The department provided several presentations for local school groups as the school year came to an end. Several schools traveled to visit the Headquarters or Greenwood Stations, and the department visited the Dolbeare and Woodville Schools with Ladder 1. Wakefield’s Ladder One was out of service for approximately ten days in early June, as it received its annual preventative maintenance, new brakes and new springs. While our ladder truck was out, we were fortunate to be able to borrow the City of Chelsea’s spare ladder truck, so we could continue to provide adequate coverage. We are grateful to Chief Joe Siewko and the Chelsea Fire Department for their support and assistance. The Wakefield Fire Department observed our annual Firefighters Memorial Services on Sunday, June 11th at Lakeside Cemetery. Wakefield Firefighters Relief Association President Firefighter Sean Curran again planned and executed an excellent ceremony honoring the department members of the Wakefield Fire Department. Ventilation and overhaul operations at a pair of vacant, soon to be demolished, houses on Oak Street. A special class on Firefighter Safety and Rehabilitation. The Wakefield Fire Department responded to 327 emergency incidents during the month of May 2006 including 65 Box Alarms and 262 Still Alarms, a total much higher than the average monthly responses. While April was an unusually dry month, May was an abnormally wet month, with the town receiving some 15 inches of rain in the period May 12 – 23rd. The heavy rains kept the fire department and all town departments very busy in responding to flooded streets and flooded basements. The incident response totals listed above for the fire department do not include some 307 responses to assist residents pumping out flooded basements, shutting off utilities, etc. Frankly, we were just too busy to record each and every response made during this period! The flooding was so severe that both Middlesex and Essex counties were declared a disaster area by the Federal Emergency Management Agency (FEMA), which now opens the door the for town and individual residents to apply for federal assistance. The fire department responded to 9 mutual aid requests during April, including Melrose (3), Reading (1), Lynnfield (3), Lynn (1), and Saugus (1). The department received mutual aid on 3 occasions from Stoneham (2) and Lynnfield (1). Review of the aerial ladder pipe operations. Review of the drafting procedure - pumping from lakes, streams, pools, etc. An opportunity to tour a new renovated commercial building at 360 Audubon Rd. The department also completed our annual testing of all hose during the month of May and hosted several Kindergarten / pre-school groups who visited our stations during the month. We responded to 256 emergency incidents during the month of April including 49 Box Alarms and 207 Still Alarms. David Sokol photoApril continued to be an unusually dry month, resulting in several brush and grass fires including a secluded, and hence difficult to access, brush fire in Crystal Lake Park on April 18th. 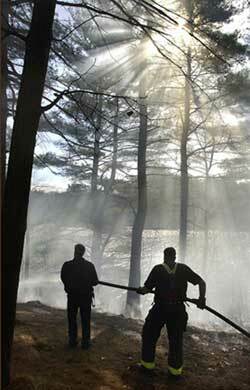 The high brush fire hazard also resulted in several mutual aid responses during the month. The fire department responded to 9 mutual aid request during April, including Melrose (4), Reading (1), Lynnfield (2), Stoneham (1), and Saugus (1). Review of “reverse lay” - hydrant and hose procedures. Review of the operation of our rescue boats. Review of master stream appliance operations. An opportunity to tour the new Sunrise Assisted Living facility in Lynnfield, which is a first alarm response for Wakefield Fire. In accordance with a Federal mandate, all cities and towns are required to adopt and implement the National Incident Management System (NIMS) by September of 2006. Firefighters and Police Officers have been completing this training as part of their ongoing training program(s). On April 25th, the Massachusetts Emergency Management Agency provided a 3-hour NIMS 700 training class at the Public Safety Building that was designed for and attended by Public Works, Gas & Light Department, School and other municipal employees who may play a role in mitigating an emergency incident in Wakefield. The Wakefield Fire Department responded to 220 emergency incidents during the month of March 2006 including 42 Box Alarms and 178 Still Alarms. March was a relatively dry month, with very little snow cover or rain, that increased our responses to brush / wild fires in March. The danger of wildfires is expected to continue into the month of April. The fire department responded to 7 mutual aid requests during February, including Melrose (2), Reading (1), Revere (1), Lynn (1), Malden (1) and Saugus (1). 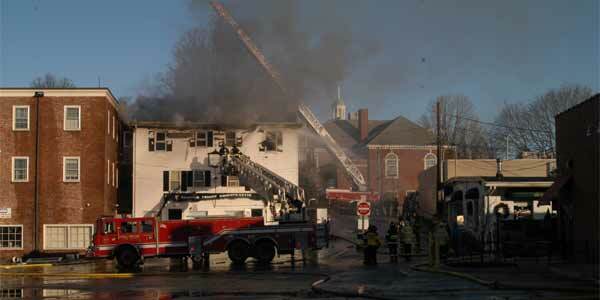 Wakefield received mutual aid on 2 occasions during March, both from the Town of Stoneham. An excellent presentation on fitness, wellness and nutrition presented by William Bradley courtesy of the Employee Benefits Dept. and MIAA. An excellent presentation on “street drugs”, what we as first responders to medical emergencies can expect as well as the danger of meth labs that are now appearing in suburbia. On March 31, the new state law entitled “Nicole’s Law” became effective. This law requires that each and every residential property be equipped with carbon monoxide detectors. The implementation of this law has kept the Fire Prevention Officer very busy in conducting inspections, answering questions, and in a public outreach campaign to publicize the new regulations and prepare for their implementation. We have met with local realtors, the local newspapers, and the WMGLD through their billing system to help “spread the word” on this new regulation. The Wakefield Fire Department responded to 213 emergency incidents during the month of February 2006 including 41 Box Alarms and 172 Still Alarms. The most serious incident handled by the department in February was a garage fire in a single-family home at 9 Orsini Drive on Saturday afternoon, February 4th, 2006. The fire was started by one of the occupants who accidentally ignited his clothing and in turn ignited combustibles stored in the garage. Firefighters made quick work of the fire, confining it to the garage, but the occupant suffered serious burns and was transported by paramedics to Massachusetts General Hospital. The fire department responded to 7 mutual aid requests during February, including Melrose (4), Reading (2) and Saugus (1). Fortunately, there were no incidents in Wakefield during February that required mutual aid to respond to Wakefield. In the area of Fire Prevention, the department was very busy during February conducting final inspections of the latest building to be completed at the Wakefield Crossing Condominium Complex off Albion Street. In addition to the overall building inspection, 25 condominium units needed smoke detector, carbon monoxide detector and non-vented gas fireplace inspections. The Wakefield Fire Department responded to 245 emergency incidents during the month of January 2006 including 45 Box Alarms and 200 Still Alarms. The New Year was only one hour and six minutes old when firefighters were called to Vernon Street and had to use the “Jaws of Life” to extricate three victims of a car vs. tree accident. A strong wind and rainstorm on the afternoon of January 18th kept firefighters busy dealing with storm related issues including a large tree that crashed into a home on Grove Street. Wakefield Firefighters also responded as part of our mutual aid agreement to assist in battling two major fires that occurred in Reading. The first Reading three-alarm fire gutted a block of stores on North Main Street in frigid weather conditions during the early morning hours of January 16th, and we assisted Reading at a second three-alarm fire on Woburn Street in Reading Square on the morning of January 17th. The Rotary Club of Wakefield donated a MARSARS Ice Rescue Sled and accessories to the fire department in January. This device will greatly enhance our ability to reach and rescue a victim that has fallen through the ice on one of our many bodies of water throughout Wakefield. This is an excellent tool that we are grateful to have but hope that we never have to use, and represents a gift in the order of $2,000 to the town. 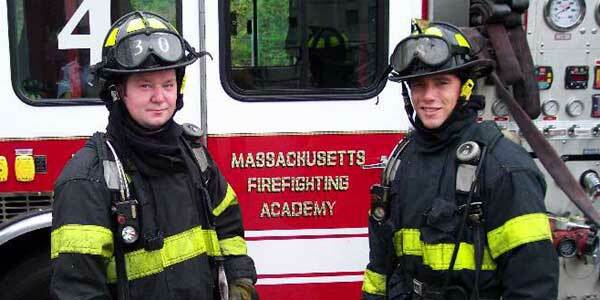 Wakefield Firefighters Eugene Doucette, III and Robert Ford entered the Massachusetts Firefighting Academy – Recruit Firefighter Training Program on January 9th. This is a 12-week program conducted at the Fire Academy facility in Stow that is provided at no cost to the community, and affords our newest firefighters with excellent BASIC firefighting training. They are scheduled to graduate on March 31, 2006. During January the department hosted a Massachusetts Firefighting Academy training program entitled “Elevator Rescue”. This excellent 6-hour program instructed firefighters on techniques to use to rescue victims trapped in disabled or stalled elevator cars, something we are seeing more often in Wakefield.